Surveilstar provides total control over every employee's usage of Yahoo! messenger. It makes it possible for worried employees to track their staff members' Yahoo! messenger, record text messengers of yahoo and list them with details like chatting content, participants, start time, end time, computer name... It also supports recording reports export on analyzing employees' working performance. Thus, it offers a reference to employers on judging whether the employee is worth being praised or guided. Yahoo! 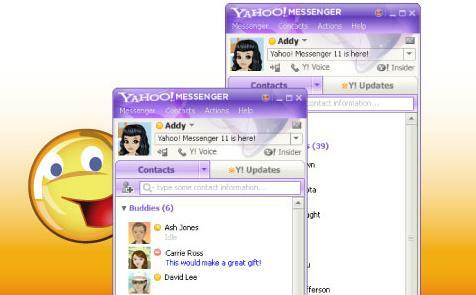 messenger, sometimes abbreviated YIM or YM, is one of the mainstream instant messaging tool provided by Yahoo!. It is originally launched in 1998 under another name- Yahoo! pager. But apparently, Yahoo! messenger makes it much more popular and accepted by people around the world. It is not surprising for many to know that the Yahoo! messenger is one of the world top 3 IM tools which take possession of the whole instant messaging market. It is also not surprising for them to know that there are 5,000,000 live users logging in for on-line chats via Yahoo! messenger. Then, it would be no difficult for many to understand why so many bosses or managers in companies want to ensure the proper use of messenger by monitoring Yahoo! chats. Surveilstar is a leading brand in employee monitoring software catalog. It offers the most professional guide and solution on the tough problem- how to monitor employees' use of Yahoo! messenger. To begin the monitor, installing surveilstar properly on computers is the top priority. How to install surveilstar to begin the monitor? Step1: Click here to download surveilstar. Step2: Follow the user guide to start the installations. Step3: Follow the instructions to deploy surveilstar for a perfect monitoring. How to Track Text Messages of Yahoo! Messenger? After the deployment of the surveilstar, a connection between agent and console/server will be built. Enter the console to see the computer icons on the right bar. The monitored pcs will be listed in unclassified groups. Click "Monitoring" button next to the pc list. Choose "Instant Message" option to see the recorded Yahoo! chats content. How to Block Yahoo! Messenger? Set policy via "Basic Policy" and "Advanced Policy". Select the unwanted instant messaging client as "block". How to Export Record Reports? Right click any record and choose "Export IM Conversation". Try Surveilstar to Begin your Yahoo! Messenger Monitoring Now!